Competing in the 1927/28 Inter-Provincial Senior Hockey League, the University of Manitoba Varsity was made up of several players with Senior playing experience. 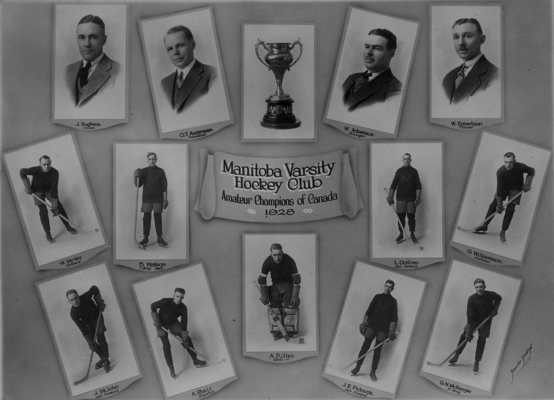 Blake Watson and Gord MacKenzie had been leading scorers with the Winnipeg Tigers Club. Art Puttee had been in the nets for the Varsity Juniors when they claimed the 1923 Memorial Cup. Taking the Inter-Provincial title in a 2 game total-point series over Fort William 2 - 0, the Brown and Gold faced the Trail Smoke Eaters in the Western 2 game total-point final at the Winnipeg Amphitheatre Rink. The Varsity would earn a berth in the Allan Cup final with 6 - 0 and 4 - 0 victories. Meeting the Montreal Victorias in Ottawa for the national title, Varsity lost the first game 2 - 0. In the 2nd match a hat trick from Blake Watson lifted the Varsity to a come-from-behind win 6-3 to force the deciding 3rd game. Gord MacKenzie would score the only goal of the 3rd game and tight checking secured a 1 - 0 win for the Varsity and the Allan Cup title.